Maine has had a water classification system since the 1950's. 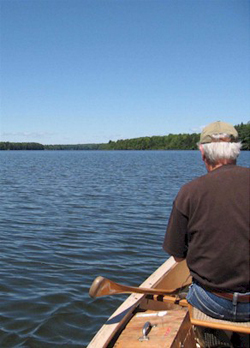 This classification system establishes water quality goals for the State. The classification system is used to direct the State in the management of its surface waters, protect the quality of those waters for their intended management purposes, and where standards are not achieved, direct the State to enhance the quality to achieve those purposes. The classification standards establish designated uses, related characteristics of those uses, and criteria necessary to protect the uses, and establish specific conditions for certain activities such as the discharge of wastewater. While it is desirable for the actual quality of a water to achieve the standards in any proposed classification, classification assignments can and should be made where there is a reasonable expectation for higher uses and quality to occur. Upgrades to classification are desirable where there is a social or ecological necessity to attain higher standards, and where the technological and financial capacity exists to achieve those higher standards within a reasonable time. Once a classification assignment is made, and the uses and criteria are achieved, that goal is protected by the antidegradation provisions of the water quality statute (Section 464(4)(F)). Thus, the law provides a mechanism for the State to continually move forward in the improvement and protection of water quality. Downgrades to classification have been infrequent and are limited to situations where existing conditions do not afford the possibility to achieve the higher class. The State has four classes for freshwater rivers (AA, A, B, C), three classes for marine and estuarine waters (SA, SB, SC), and one class for lakes and ponds (GPA). A close comparison of the standards will show that there is actually not much difference between the uses or the qualities of the various classes. All attain the minimum fishable-swimmable standards established in the federal Clean Water Act. Most support the same set of designated uses with some modest variations in their description. The classification system should be viewed as a hierarchy of risk, more than one of use or quality, the risk being the possibility of a breakdown of the ecosystem and loss of use due to either natural or human-caused events. Ecosystems that are more natural in their structure and function can be expected to be more resilient to a new stress and to show more rapid recovery. Classes AA, GPA and SA involve little risk since activities such as waste discharge and impoundment are prohibited. The expectation to achieve natural conditions is high and degradation is unlikely. Class A waters allow impoundments and very restricted discharges, so the risk of degradation while quite small, does increase since there is some small human intervention in the maintenance of the ecosystem. Classes B and SB have fewer restrictions on activities but still maintain high water quality criteria. Finally, Classes C and SC have the least restrictions on use and the lowest (but not low) water quality criteria. Classes C and SC waters are still good quality, but the margin for error before significant degradation might occur in these waters in the event of an additional stress being introduced (such as a spill or a drought) is the least. Standards and Classification. The reclassification of waters of the State is governed by 38 MRSA Sections 464(2), 464(2-A) and 464(3). This statute requires the Department of Environmental Protection to conduct water quality studies, and the Board of Environmental Protection to hold hearings and propose changes to the water classification system to the Legislature for final approval. This is to be conducted from time to time, but at least every three years. In 2009, a comprehensive round of reclassifications resulted in a number of changes to the water classification system; in 2011, one change was enacted. The Department is currently engaged in a new re-classification initiative; please see here for further details. The links in the list below for specific sections in the classification law go to a data base of statutory sections maintained by the Maine Reviser of Statutes. The data base is usually updated a few months after the end of a session. Always read the disclaimer on the Reviser's site to determine when the statutes on the web were last updated.